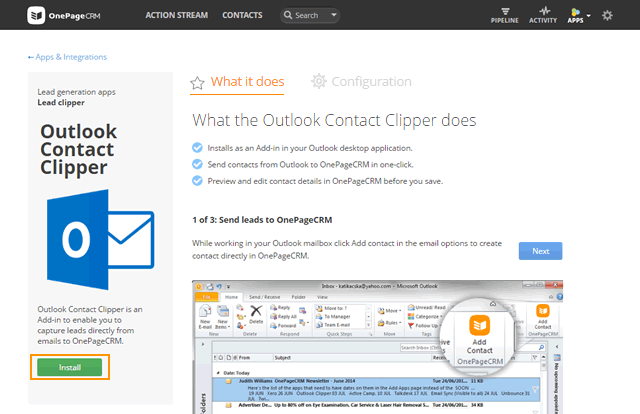 Outlook Contact Clipper is an add-in to enable you to capture leads directly from emails to OnePageCRM. The clipper provides a quick and easy way to save contact details from Outlook directly to your OnePageCRM account. 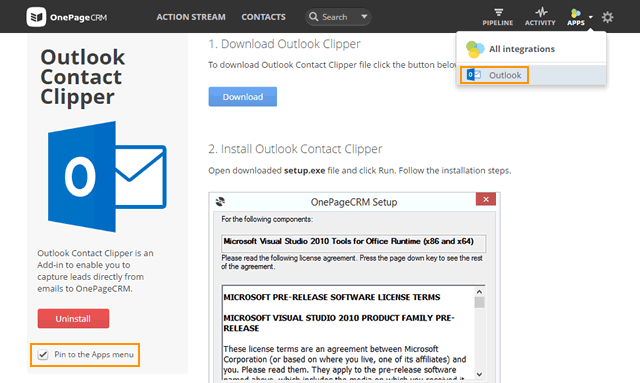 Go to Apps → All Integrations → click on the Outlook Lead Clipper icon under the Lead Generation Apps category. Under the Configuration tab, click Download. Save a setup.exe file → open it and follow the instructions to install the Add-in. Open your Outlook desktop email client (Microsoft Outlook 2010 or 2013) to check if Add Contact OnePageCRM icon appears in the inbox ribbon. If Add Contact icon is not present go to File → Options → Add-Ins → select OnePageCRM from Inactive Application Add-Ins list → click Go... under Manage: COM Add-ins. Select check-box to the left of OnePageCRM and click OK.
To push a contact to OnePageCRM, open an email of your choice and click on the Add Contact icon. Sign in to your OnePageCRM account as prompted. Review pre-populated New Contact form with details pulled from Outlook → edit if needed and click Save. 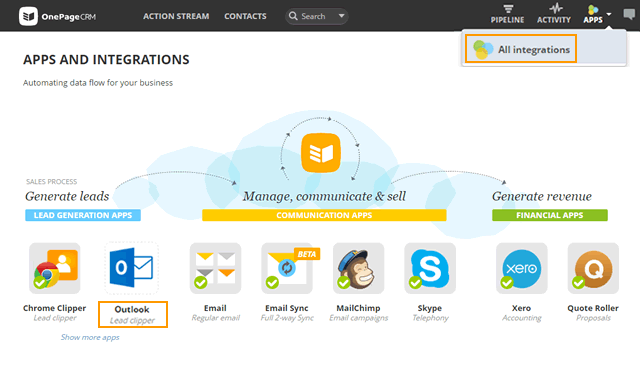 Once a contact is saved you can assign a Next Action and view it in your Action Stream. To pin the Outlook Contact Clipper integration to Apps menu, select the check-box Pin to the Apps menu. Outlook contact details pushed to OnePageCRM include: First & Last name, Organization, Job title, Websites, Email addresses, Phone numbers and Notes. A background tool, Microsoft Visual Studio 2010 Tools for Office Runtime, is required to install any Office Add-in. If not present already you'll be prompted to install it. System requirements for OnePageCRM Outlook clipper: Microsoft Outlook 2010, Microsoft Outlook 2013 or Microsoft Outlook 2016 on Windows operating system.